One person has been killed in an attack in Pakistan's Balochistan province, the latest in a spate of attacks against non-Balochi people in the region. Police said three others were also injured when a group of rice traders from Punjab province were attacked. An armed separatist group, the Balochistan Liberation United Front (BLUF), has claimed responsibility. 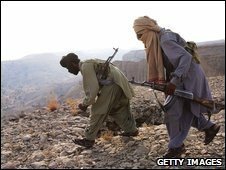 Officials say nearly 40 people have been killed by Baloch separatists in the province since the start of 2009. The killings are part of a campaign by armed groups to drive non-Balochi people out of the province, according to officials. The traders had come from Punjab province to sell rice at a weekly market in Quetta, the capital of Balochistan province, police said. They were shot near the market on Sunday by assailants on two motorbikes. Six people have been killed since Friday in similar targeted killings, police said. After Sunday's attack, police arrested dozens of suspects in overnight raids. Balochistan accounts for nearly 40% of the country's area but it has less than 10% of its population. The province is rich in natural resources but has almost no representation in the central bureaucracy or the army, the two groups that have for the most part ruled Pakistan, says the BBC's Ilyas Khan in Islamabad. As a result, Balochistan remains a province steeped in poverty and with an undeveloped infrastructure, our correspondent says. Since 2001, armed groups have been conducting a violent campaign to prevent the army from setting up garrisons in the province and to discourage major development projects that they believe would benefit businesses and workers in other provinces. They have been demanding political autonomy and greater provincial control over their natural resources. Hundreds of Baloch political activists have been detained in "undeclared custody" and activists claim that a number have been tortured and killed. Officials say the targeted killings are part of a strategy on the part of these groups to drive non-Balochi settlers out of the province and to discourage people of other provinces from taking up jobs or setting up businesses in Balochistan. Initially, it was mainly Punjabi's - Pakistan's biggest ethnic group - who were targeted. But in recent months armed separatists have also targeted ethnic Sindhis and Pashtuns from the North West Frontier Province, police say.